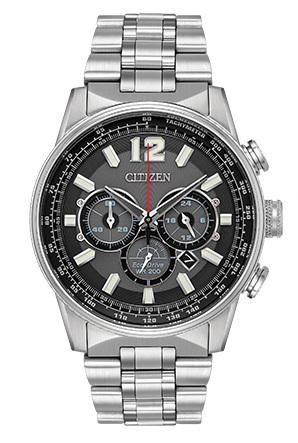 CITIZEN®'s revamped and reinvented Nighthawk collection is designed to impress! Shown in a stainless steel case and bracelet, this timepiece features a 1/5-second chronograph that measures up to 60 minutes, 12/24-hour time, a tachymeter, and a screw-back case. Water resistant up to 200 metres.